Our hero is 11-year-old Robert Arthur, and he's among the first students entering the brand new Lovecraft Middle School (LMS). The town is a buzz over the extraordinary new facility and its many state-of-the-art features. Solar panels! Radiant floor heating! Wireless internet! Digital smart-boards in every classroom! LMS is truly the school of the future. Better still, it's a totally green building, constructed almost entirely of recycled materials. But Robert soon discovers some strange mysteries. Rats in the lockers. A student goes missing. And he encounters an old section in the school library - a corridor full of worm-eaten, antiquated books. How did such a musty dusty room end up in a brand new school? Even worse, Robert's new science professor is behaving really strangely - it will become clear over the course of the book that the professor has been consumed by some kind of demon/wraith/spirit, that it's transforming him into a monster from the inside-out. Robert tries to unravel these mysteries with some help from his new friend Karina Ortiz - but soon she presents him with yet another conundrum: Why has he never seen Karina outside the walls of Lovecraft Middle School? The answers to all of these riddles lie in the fact that LMS was constructed almost entirely of recycled materials - but these materials came from the abandoned Tillinghast mansion, a large ancestral home and hotbed of weirdo paranormal activity. After decades of unpaid taxes, violent episodes, and unexplained phenomena, the state government tore down the hospital but then essentially REBUILT the same materials into a new building. And thus Lovecraft Middle School was born. 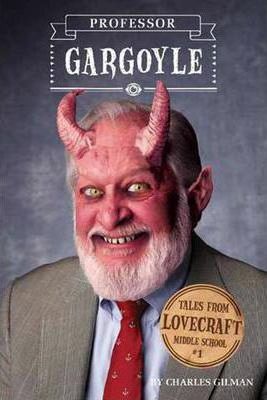 By the end of this first volume, Robert will vanquish Professor Gargoyle and learn the creepy origin story of LMS. But his troubles are just beginning. There's something odd about the lunch lady in the cafeteria ...and report cards are getting mailed home next week! Charles Gilman lives in Philadelphia. This is his first book for young readers. Eugene Smith has illustrated several titles for Quirk, including Sense and Sensiblity and Sea Monsters, The Captain Jack Sparrow Handbook, and Secret Lives of the Supreme Court.